Pre-heat oven to 325 °F. Grease and coat a Bundt pan with flour. Sprinkle the pecans over the bottom of the pan. In a large bowl, beat all the cake ingredients together until evenly mixed. Pour the mixture over the pecans and smooth the surface over with a spatula. Bake for one hour. To check if it’s ready, insert a knife in the middle of the cake. If it comes out clean, the cake is done. Prepare the rum syrup during the last 10 minutes of baking, before the cake is completely cooked. In a pot, melt the butter before adding the water and sugar. Let simmer for 4-5 minutes while stirring constantly. Turn off the heat (very important!) before pouring the rum into the mixture; this will prevent any accidents or burns! Stir in the mixture until the rum has blended into the syrup, then re-heat for 30 seconds to finish. When the cake is ready, remove from the oven and immediately poke the flat base with a toothpick. While still hot and without unmolding, pour a bit of the syrup over the cake to let it soak in. Let sit for five minutes, then remove from the mold carefully poke the surface of the cake, taking care not to damage it. Pour the remaining syrup over the cake. Walnuts, toasted almonds or golden raisins can be used as a topping for this cake. You can use pistachio pudding in the recipe, and use pistachios and walnuts as toppings. Another delicious alternative is Pillsbury’s™ devil’s cake mix with an instant chocolate pudding. 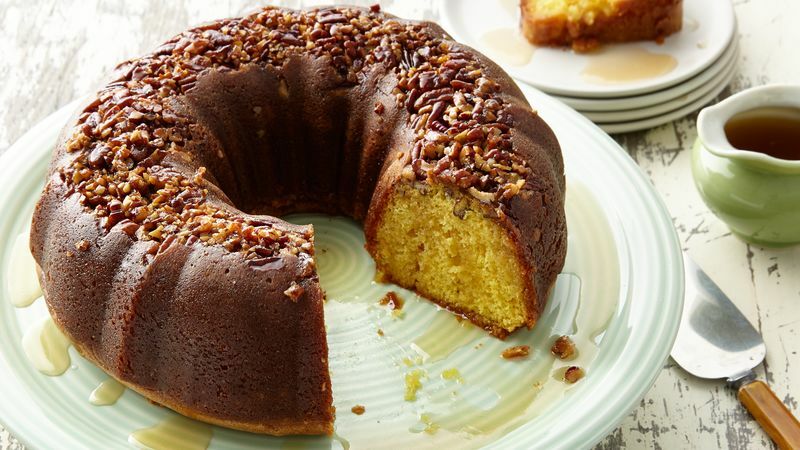 Rum cake is a delicioso dessert that is prepared in almost all the Caribbean islands, including my beloved Puerto Rico. And that’s not surprising, since we’re known for having some of the most famous rums in the world; it would be a shame not to use them to provide an exotic touch for our dishes and desserts… like rum cake! This is known in Spanish as bizcocho caribeño, and it’s basically a spongy cake crowned with a syrup made of sugar and rum. The recipe is simple, but the taste is extraordinary!